Just quitting cola cold turkey is a lot harder than finding a better and healthier drink to replace soda with. To make withdrawal easier an effective soda substitute should be similar enough to cola in taste, while cutting out the unhealthy and addictive ingredients like sugar, phosphoric acid and caffeine. It sounds like a tall order but it is possible using special high antioxidant superfruit concentrates like this. This page explains how to make healthy alternatives to soda or diet soda that taste similar to manufactured carbonated drinks, but can actually be beneficial for your body and long term health. While it’s important to drink more water when you’re replacing soda, water alone is too plain, in my opinion, to be a real coke replacement for most people. The same goes for milk, which has other potential health issues, like lactose intolerance that makes you fart. Commercially produced fruit juices are not a healthy option either. The vast majority have been processed in a way that makes drinking them spike your blood sugar dramatically and elevate insulin. This usually brings on an blood sugar crash, which is the last thing you need when giving up a caffeinated drink like cola that is already taxing your adrenal glands. Virtually all other commercially produced sweet beverages are loaded with fattening sugar or the even worse high fructose corn syrup. Some people turn to artificially sweetened drinks, but these usually contain aspartame which is now being shown in studies to be just as if not more damaging than sugar from a weight gain and diabetes risk — not exactly a healthier option. To be effective your soda substitute needs to be portable, ready to go a moments notice and similar enough to cola in the ritual of drinking it, without being any of the above. Here’s the solution that worked for me. Simple, plain soda water, also called carbonated mineral water or sparkling water, is available from the supermarket in the same soft drink sized bottles as coke and diet coke. It’s much cheaper than brand name sodas and importantly, it has the fizz without the massive amounts of sugar, HFCS or toxic aspartame, corrosive phosphoric acid, or potentially dangerous sulfite ammonia caramel coloring 150D. It also has no calories and no addictive caffeine. Some people like premium sparkling mineral waters like San Pellegrino with a little lemon juice or lime. If that works for you then please stick with it. For the purpose of this article though, I’m going to assume most soda addicts have a sweeter tooth than that and are looking for more flavor or tang in their replacement. The first thing we need for our healthy soda alternative is a good supply of sparkling water. The same number of bottles as you would usually have bought of cola for two weeks. Importantly, this is plain soda water only. No flavorings, no additives. The label should read carbonated or sparkling water and that’s it. Definitely no sugar, HFCS, aspartame or any other artificial sweetener. Tonic water is a different sweetened product and is unsuitable to replace soda with if you are looking for a truly healthy substitute for soda. Next we need our flavorings. For that I recommend a new range of superfruit concentrates that have just recently come onto the market. Unlike regular cordials or concentrates, the ones I’ll list ahead are full of antioxidants and nutrients, without added sugar or sweeteners and actually good for you. Superfruit concentrates diluted with sparkling mineral water make for great tasting and very healthy alternatives to soda. These concentrates are made from special fruits and berries, often found in rainforests like maqui berry and acai, that are unusually high in antioxidants, vitamins and other beneficial nutrition. It’s only in recent years that the demand for these kind of products has reached a level where they are no longer only affordable to the rich. In fact, some of these superfruit concentrates are amazingly good value for all of the health nutrients they provide. They may well be the ‘multivitamins’ of choice in the future. I’ve spent quite a bit of time researching and trying the different ones available so let’s have a look at some of the best. Dynamic Health have a good range of superfruit concentrates. My favorites in terms of best price, high in nutrients and potential as a great tasting soda replacement are the tangy and delicious black cherry and the antioxidant rich pomegranate concentrates. Both of these are concentrated juice only with no added sugar (though check the label on others in the range) and make for a serious health supplement in and of themselves. Compare the health benefits of these superfruit drinks to the damage corrosive cola is doing to your digestive system and the choice is pretty clear. For an even more exotic option there’s this extra sized maqui superberry concentrate, with maqui berry, acai, pomegranate and blueberry and an extremely high ORAC antioxidant rating. These three are my favorite superfruit concentrates but there are many others available. Just make sure whatever you choose to make up as your soda substitute is free of added sugar or diet sweeteners. Drinking these high antioxidant concentrates as a healthy alternative to soda has real potential to make a positive improvement in your health. I doubt even the soft drink manufacturers would dispute that drinking cola in excess can only damage it. Despite being directly opposite in healthiness, these superfruit concentrates mixed with sparkling mineral water make a great tasting substitute to drinking soda. They might not have quite the same bite as coke, but when you realize that bite actually comes from soda’s high acidity combined with massive amounts of high fructose corn syrup, it shouldn’t be a very difficult choice if you’d like to avoid obesity, diabetes and many other diseases of excess HFCS consumption. There’s something special about the exotic ingredients and the unique flavors in these concentrates that makes them particularly good for replacing soda. 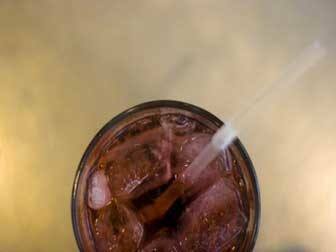 Additionally, the high antioxidant and nutritional content can only help with caffeine withdrawal when giving up soda. If you try any of these superfruit concentrates for soda replacement please let me know what you think and how they make you feel after using them for a while. Unlike most store bought beverages, they are not loaded with sugar or high fructose corn syrup, so most won’t be super sweet. The flavors are more subtle and complex than that. If you like, it’s fine to add a few drops of healthy stevia to the mix to sweeten them at the start, but ultimately try and lower this over time and get used to less sweetness in your beverages. You may find yourself reducing sugar intake in other areas as well and that can only be good news for your health. Next is a 10 step plan to stop drinking soda once and for all. If you follow this simple plan for two short weeks you’ll have a great chance at kicking the habit for good with these healthy soda alternatives, and looking and feeling much better for it. How much of the concentrate do you mix in to the water? It depends on the strength of the concentrate. Usually they’ll have a recommendation on the bottle but it often only requires a tablespoon or two. Kava is one of the strongest. L-theanine powder is also quite good, particularly if you have caffeine as it moderates the effects and reduces overstimulation. Thanks for your positive comments Jason. Hi Jim, what do you think of kombucha as a replacement for soda? I’ve never been much for sodas but really enjoy my homemade kombucha — plain, or flavored with bits of fruit. I make mine with 2/3 black to 1/3 green tea and ferment until reasonably sour. then second ferment to give a refined fizz. Is this a good soda substitute? Yes, properly brewed kombucha that has fermented out the sugar would be a great substitute and highly recommended. Unfortunately most people won’t go to the trouble of making it up so I felt the superfruit concentrates were a more easily used option. I might edit the article to suggest this though. In 1958 in P.R., I was told the pomegranate plant in my aunt’s yard was used for a homemade remedy. I suffer from gastro problems (IBS, colon polyps). Last year I had this awful upset stomach, and at a family reunion drank a pomegranate soda. In 2 minutes the pain was gone. So that’s what the household remedy was for! Thanks for the interesting information on pomegranate for gastro problems Maggie.